Mary Pearce receives the Tenny Pinkerton Dozier award, presented by Sam Huffman. On December 2, 2010, Save The Franklin Battlefield, Inc., Board members and guests met at Otey Hall, St. Paul’s Episcopal Church, for the Annual STFB Dinner and Membership Meeting. STFB President Mike Walker welcomed the guests as he opened the meeting. Sam Gant offered an invocation before the dinner which was served by Puckett’s Grocery. Following the meal, Mike called the business meeting to order and recognized the STFB Advisory Board members present, Mike Skinner and Susan Burns. Sam Huffman gave a summary of STFB’s activities of 2010 including some detail on the proposed acquisition of two important battlefield sites on the Eastern Flank: Loring’s Advance and the Willow Plunge properties. Two Board members were then reelected by acclamation: Sam Huffman and Tommy Burnett. Sam Huffman officiated the presentation of the Tenny Pinkerton Dozier Award. This award is given each year to the Individual who, in the judgment of the STFB Board, made the most notable contribution during the past year to historic preservation. 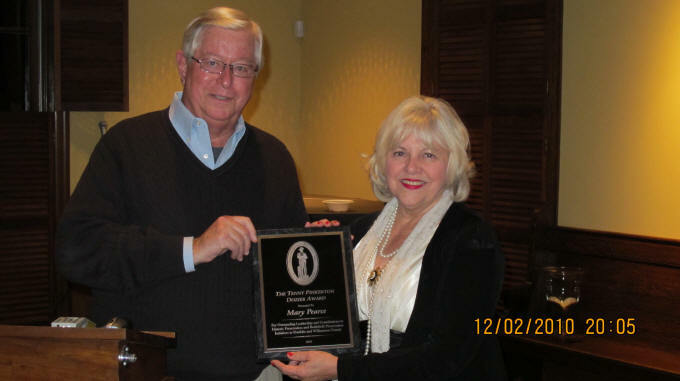 The 2010 Tenny Pinkerton Dozier Award was presented to Mary Pearce, Director of the Heritage Foundation for her continuing work to preserve Franklin’s Battlefields and for her recent project to save and restore the Franklin Theater. preserving the battlefield sites so that one can better visualize the significance of the conflict when walking the ground where the battle was fought. The meeting closed, after concluding remarks by Mike Walker. Thomas Flagel is the author of a series of history books: A History Buff’s Guide to the Civil War, A History Buff’s Guide to Gettysburg, A History Buff’s Guide to World War II, and A History Buff’s Guide to the Presidents. Thomas is a Board member of the Friends of Fort Negley and of the Franklin Civil War Roundtable, and he assists and speaks at a number of other historical organizations. Thomas Flagel came to Columbia State from Kirkwood Community College in Cedar Rapids, Iowa. He holds degrees from Loras College (B.A. History), Kansas State University (M.A., European History), Creighton University (M.A., International Relations), and has studied at the University of Vienna.